"Deepening our roots to foster the holistic development of every child." Directions: gently stir the two ingredients together until well mixed. Add scoops, spoons, measuring cups, sand molds, silicone bowls, plastic cookie cutters, and popsicle sticks for cutting. Materials: 2 cups flour, 2 tablespoon vegetable oil, ½ cup salt, 2 T. cream of tartar, up to 1.5 cups boiling water (adding in slowly until the texture feel right), food coloring. Directions: Mix the dry ingredients together. Add food coloring to the boiling water and then stir into the dry ingredients. Stir until the dough combines. Allow to cool a bit and then knead for a few minutes until the dough feels smooth. Directions: In a bowl, mix flour, salt and kool-aid. Stir in water and oil. Knead with hands for about 5 minutes. Store in ziploc bag or air tight container. This play dough smell great which may be too much temptation for younger children, but it’s vivid color is awesome! Seed or Grain Dough– make homemade dough as usual. When offering it to the children, set out small bowls of a variety of seeds or grains. Children can pretend to plant the seeds into the dough. Once the seeds are kneaded into the dough it has a great texture. Seeds to try —sunflower, flax, squash, pumpkin, wheat berries, corn, rice, poppy, or any excess seeds that you gathered from the previous growing season. Directions: In a bowl, mix all the dry ingredients, then add the oil, grown up pours in boiling water, and mix. Let cool for a bit, then knead until smooth, add in glitter. White Play Dough is great for making snowmen, add items to encourage snowmen creations: buttons, small piece of shiny pipe cleaners, beans, and beads!!! Maybe for carrot noses make rolled orange paper beads? Directions: Mix the dry ingredients together, then gradually stir in the water until it forms a dough consistency. Knead the dough for 5 minutes so that it is smooth. Let children create ornaments or 3D creations out of the salt dough, if the item will be hung, use a straw to poke a hole in it prior to baking. Bake at 200F until dry. Most thin ornaments will dry in 1 hour, but thicker creations may need 2 hours. Check on the items, and if anything seems to be curling, flip over part way through the baking time. After cooled, children can paint their creations with acrylic paint and a grown up can seal with clear varnish or polyurethane spray. Imagine in your mind a preschool classroom and likely you immediately think of a busy, noisy, and chaotic room filled with little people running to and fro. Then imagine that you are a “quiet child”, what does this busy classroom look like to you? As an early childhood educator, I want to ensure that my classroom is welcoming and inviting to ALL children. So as I design my classroom and set up my learning centers I want to ensure that there are spaces that are offer privacy and quiet for children to go to seek solitude. This might be the writing center that is sized for just two children at a time or a listening center with only two headsets. This might also be a small table in a corner of a classroom set up with a felt board or puzzles that invites just a couple of children at once. The expectations of these private and quiet areas are explicitly taught to the children. We work towards learning not to interrupt children who are playing in these areas, that our voices are softer, and that we call all have a turn in the area when space allows. These quiet and private spaces are not used as a punishment, and staff don’t send children there as time out. Rather these spaces are seen as an oasis that children learn to enjoy to select on their own. I share information with parents about how we use these spaces and encourage them to create a similar area at home. I believe that creating these spaces for privacy and quiet help to empower children to know that when they feel like they need to take time to themselves that they can. Often I find that children retreat to these quieter areas and observe what is happening in other places in the room. It is important that we remember that about one third of the population is ‘introvert’ and that it is not our role to make children more extrovert. One of the best books that I have read in my career is “Quiet: The Power of Introverts in a World That Can’t Stop Talking.” This book really helped me understand that our ‘quiet children’ do not lack energy and are not missing social skills. Instead we need to honor introverts for who they are and that means that we create space for them to be in the role of observer, time to be reflective, and support in finding quiet amongst a busy classroom environment. I had this vision of creating a model maple tree that my preschoolers could tap and pretend to collect sap. I wanted the kids to have some first hand experience before we took them to a local sugar shack. So I found the largest piece of cardboard I had, and got to work crafting a maple tree. Then I recruited my then five year old to help me practice collecting the sap. He was a bit dismayed at how slow the drips were, but once a puddle of ‘sap’ collected in the bowl he became excited about the process. As with many of our projects and experiments, I lost interest long before him. He continued to collect the sap for almost an hour and only stopped because his little sister started dumping the sap bucket! One child gets to stand in the back of the tree and starts the flow of sap by using a pipette or turkey baster to push water into the tap. The other kids watch as the sap drips from the tap, runs through the plastic tubing, and finally collects into the bucket. To keep a group of kids interested in the activity, be sure to have plenty of funnels, cups, spoons, strainers, and tubing for them to explore properties of ‘sap’. When I led this activity in my preschool classroom the kids were eager to be the one behind the tree and a line formed as they waited their turn. So I put additional pipettes in the collection bucket and they played there until it was their turn to ‘be the tree’. This activity would be great to try at home. You could use any type of hose and a turkey baster! If you don’t have cardboard to make a tree, you could use a grocery bag with a hole cut or a large oatmeal container. Check out my Pinterest board for more Maple Sugaring Ideas! Outdoor Discovery Time– I love connecting what we are learning to meaningful and real experiences outdoors. So when learning about the sense of touch, I love to my children on a “Finding Textures Walk”. In fact, I feel like I can relate most things that I am teaching about to a nature walk. What is fun about nature walks is there is always something new to discover, and it take no ‘prep work’ on the teacher’s part. Do our walks fail sometimes? Absolutely, but isn’t failing also a great life lesson? For our “Finding Textures Walk” we used our hands to explore different objects in our surroundings. The language and expressions that children come up with for different objects is inspiring and humorous. Recording the children’s dialogue while they are exploring, and then revisiting that dialogue back at a group meeting is a wonderful way to reflect on their experiences. What might you find on a texture walk? Crunchy snow, slick ice, sticky pine cones, rough and bumpy bark, smooth and paper-like bark, prickly pine needs, thorny bushes, cold hard rocks, and the list is endless. Ask your children…can you find something smooth? rough? hard? soft? bumpy? cold? Sensory Obstacle Course: whether indoors or outside, you can set up an obstacle course that features many different types of textures. Spend time looking at the outdoor play toys to find a variety of materials to include. Ideas might include: hard stepping stone, nubby texture balls, squishy foam ball, lightweight scarves, bouncy playground balls, heavy medicine ball, coarse surface on the step aerobics step, smooth wooden balance beam, bouncy trampoline, soft pillows, dense gym mats, spinning sit and spin, wobbly balance board, hard river stone steps, and the list goes on. Tag: We need our sense of touch in order to play tag. With preschoolers, I find tag is much more fun if there is a way to become un-frozen so that play can continue. Princess and the Pea: gather up a bunch of pillows and a small firm ball and play a version the classic fairy tale. Many children are not familiar with this tale, so be sure to read a version or two before trying to play the game! Add a wide variety of dress up clothes made of different materials. Prior to putting the new clothes at the center, explore the materials at circle time and discuss how they feel. I especially like to include ethnic clothes such as a silky kimono, woven Guatemalan skirts, or a wool vest. Explore Textures with Natural Materials: gather a variety of materials for children to explore. Acorns, bark, branches, feathers, flowers, horsetail, leaves, seeds, pods, pebbles, pine needles, pinecones, shells, spiky burdock burrs, and small tree cookies. Sweet gum balls are not native to my area, but I have a small collection that we gathered on a trip. My students are fascinated by them since they have never seen them before and they are so spiky. I also have a great collection of pine cones from the teeny tiny Hemlock cones to a gigantic cone that a Grandma in my program donated years ago. Kids are amazed at how different the pinecones can be, and often are inspired to start their own collections. Fabric Texture Match Ups: Cut out two swatches from a variety of fabrics. Children can practice matching the fabric swatches. Then provide a blindfold and have the children match with only their sense of touch. Texture Collage Board: Send home a note explaining that we are learning about textures and invite parents to help their child to glue a bunch of the same items to the cardboard piece enclosed. Once the collage boards are returned, keep them at the science center for children to explore. Building Our Descriptive Words using the “Mystery Box” “We’ve been learning about our sense of Touch. We are going to use our sense of touch to figure out what is in our Mystery Box.” We will do the mystery box each day during the time we are exploring our senses (or as long as it’s interesting). Use common objects from the classroom that would be easy to identify: ball, train car, paint brush, bell, cookie cutter, dollhouse furniture, thick crayon, mini binoculars, plush owl, and a block. To make the Mystery Box I took a medium sized coffee can and stretched a black knee-high nylon on the top. It held on great and the kids could reach their hand all the way inside to feel the object but could not pull it out! The nylon was dark enough that they couldn’t see the object either! 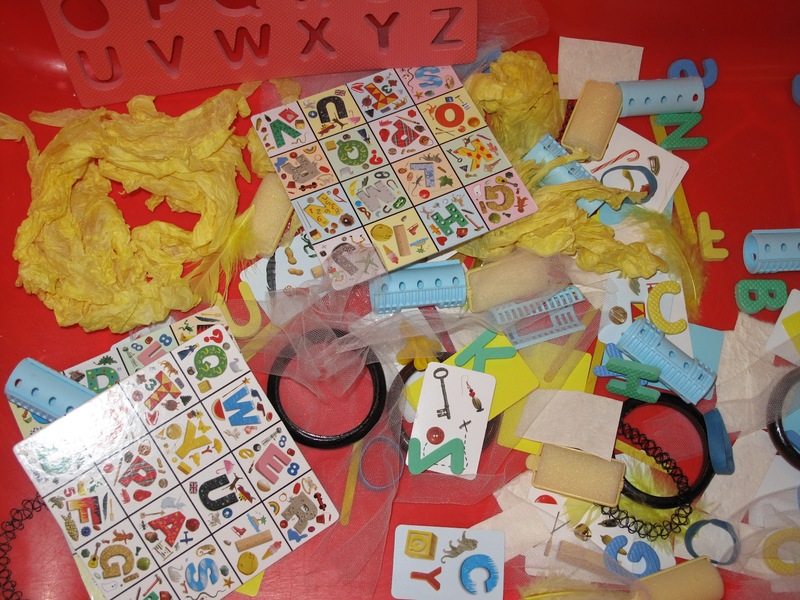 Tactile Letters, Names or Sight Words – depending on what your children are working on, you could create either sand paper letters or words. Use white glue and play sand to make each child’s name, letters, or sight words. Writing Center – Rubbings– cut out a variety of shapes from cardstock, paper doilies, or sandpaper. For young children, tape the shapes to the table so it won’t shift. Show the children how to place a piece of thin white copy paper over the shapes and rub with a thick crayon. (Note: the tape does show up in the rubbing, so if the children have the dexterity to hold the paper down without tape, the results might be better. These types of rubbings are great to do throughout the year – we explore leaves, cloud shapes, geometric shapes, hearts, egg shapes, and a variety of holiday shapes. This builds fine motor skills and is often exciting for children as the mystery picture is revealed! Sensory Texture Painting – put tempera paint in paint cups and add one of the following to each cup: coffee grounds, crumbled leaves, coarse salt, and sand. Since this paint is thicker, you might want to use it to paint onto card stock, recycled cereal boxes, or corrugated cardboard. While painting, encourage the kids to use descriptive words for how the paint feels & what they see. Paint in groups at the table to encourage dialogue between students! You could also provide a variety of things to use as paintbrushes – sponges, toothbrushes, cotton balls, forks, toothpicks, pipe cleaners, and Popsicle sticks to make their own special textures. Finger Painting: What’s the best way to explore the sense of touch…FINGER PAINT! Offer the three primary colors and slick finger painting paper, and then watch the fun exploration begin! Draw on Your Partner’s Back – explain to children that they are going to use their finger to draw a simple shape on their friends back and then the friend guesses the shape. Sandpaper and Yarn – show the children how to use small pieces of yarn to ‘draw’ on the sandpaper. The yarn sticks to sandpaper so their picture will stay without any glue or tape. Cloud Dough: Mix 8 cups of flour and 1 cup of vegetable oil in a large bin. This is a wonderful texture for the children to squish, mold, and play with! DIY Play Dough Tools: Have the children help you create popsicle sticks with a variety of materials glued on such as beads, buttons, large sequins, fuzzy sticks, and glue designs. Once the materials are dry, have the children add them to the play dough to explore what types of imprints are made when the sticks are squished into the dough. Clay vs. Play dough: children who have never played with clay before will be surprised how hard it is to squish and mold. Compare clay to play dough and talk about the differences in texture. Nature Stew: a fun way to explore textures is to gather some materials from outdoors and add them to the water table – flowers, leaves, pine cones, rocks, and bark all offer great exploration and imaginative play for making stew! Offer a ladle, bowls, and some soup spoons too! Dissolving Salt: Salt has a great texture to examine, especially when you have a variety of coarseness to explore. Offer some small containers, water, and spoons for the children to try to dissolve the salt. Warm Water vs. Cold Water Test – in the middle of water table put a medium sized bowl with very warm water. In the rest of the table, add cold water a few ice cubes and several large ice blocks. Cooked spaghetti: I don’t use food often for play in my classroom, but the explore the texture of cooked spaghetti is quite fun when exploring the sense of touch. I like to cook two boxes and then divide it into six bowls. For each bowl I use food coloring to make the colors of the rainbow. As the children play with it, the colors all get mixed up. Sensory Bin Base Materials that are Non-Food Items: shredded paper, pea gravel or aquarium gravel, snow, ice cube, pom poms, cotton balls, yarn, buttons, silk flowers, sand or colored sand, salt, dried herbs, and pinecones. Of course there are endless choices, so use what you have! “Mess Free Paint Bags”: Seal gallon sized Ziploc bags with different colored tempera paint. Encourage mark making, name writing, and picture drawing in the bags. These are also fun to explore by taping to a window or patio door, since the light makes different effects on the paint. Soft & Hard Sort Bins: using the same objects in the sensory texture bin, have students sort by soft/hard. Adding fabric to the block center is a great way to offer a different texture to explore. Also offering a variety of small world play props such as plastic animals, wooden people, or metal cars can add variety as well. Children need hands-on manipulatives to learn early math skills. Offer them a variety of natural materials such as shells or rocks to give them a different experience than the plastic teddy bear counters. Play dough Math Mats: children can create snakes to form their numerals, and create little balls to match the number. Google “play dough math mat” for free printables to add to your play dough center! Textures Numerals: create numeral cards by using white glue and sand, these cards can be kept with the math materials for children to feel. Dot Mats – draw the numeral and matching number of dots, then the child uses pebbles to put on the dots to match the numeral. In the Science Center section, I mentioned making “Texture Collage Boards” as a home/school project. Instead of putting these at the science center, create a “Texture Wall” as a fun collaborative bulletin board full of different textures for the children to touch and explore! Texture Snack: Ask families to send in snacks that have various textures. One year my preschoolers were shocked to find out that they loved seaweed and some only tried it because we were doing a texture investigation at snack time! Check out my Pinterest board for even more Five Senses teaching ideas! There are so many wonderful ways to explore our sense of hearing! Outdoor Exploration: “Listening Walk” – guide the children in becoming still, closing their eyes, and listening for sounds for 20 or 30 seconds. Then try for 1 minute. Go longer if they are attentive. When my daughter was two she loved to play this game on our walks…mostly because we had lots of woodpeckers and she was an expert at hearing and then locating them! We would walk through our woods and stop and listen for sounds. She loved to be the first to point out a woodpecker or identify another sound in nature! Before going on the sound walk, read aloud the wonderful book The Listening Walk by Paul Showers. “Bird Sounds” – encourage children to listen to the birds in the outdoors, try to see if you can figure out where the sound is coming from, and if possible, identify the bird. Young children enjoy mimicking the bird sounds, though their enthusiastic crow calls might scare off the rest of the birds! To learn more about bird sounds, consider downloading a bird call app and learn many of the bird calls in your area! Try setting up some bird feeders outside your windows for the children to observe and listen carefully to their sounds. Children soon discover that the quieter they become, the louder the birds will become! “Echo Game” – explain to the children what an echo is, and then have them echo some sounds or words that you make. Then the children spread out throughout the play space and you echo the sounds that each other makes. Pick someone to be ‘IT’ and then they pick the next child to be it. Try spreading out and seeing how it becomes more difficult to hear when the children are farther away. “Listening to the Creek” – explain that the creek makes different sounds depending on the season. What does the creek sound like today? How would it be different in another season? We have discovered that at times it’s a quiet trickle and others a loud rushing ‘river’, and at other times the water actually runs underneath the ice and creates a muffled sound. Oh the opportunities to learn vocabulary in nature! “Outdoor Sound Wall” – in the outdoor play area, create an interactive sound wall by hanging a variety of old pots, pans, metal lids, plastic containers, bells, wood blocks, different lengths and widths of pipes, hollow tubes, PVC pipes, and anything else that makes interesting sounds! Provide mallets or sticks for the children to use to create sounds. *Check Pinterest for additional ideas in creating a sound wall! “Bells on Boots” – tie a jingle bell onto each child’s boot laces. Then have the children dance, hop, stomp, and walk around the room or yard. Try a game of hide-and-seek with the bells on and talk about why it’s easy to find other kids when their bells shake. An easy way to make these is to use small jingle bells, thread a twist tie through the hole on top, and then twist onto shoe laces. I find if you put the bell on the child’s zipper pull they will hold it and muffle the sound…which could be a whole other type of learning. “Bubble Wrap Walk” – lay down a large section of recycled bubble wrap for children to run and jump on. What sounds do we hear?! Dramatic Play: add instruments and dress up clothes and props so children can pretend to be musicians. Perhaps 80s Rock Stars?! Science Center: “Sound Station” – create an interactive set of noise makers that the children can explore. Some ideas include: set of hand bells, clear rain stick, toy cell phone, cat “meow” or cow “moo” toy that makes sounds when you turn it upside down, toy microphone to amplifies, wooden or metal xylophone, wind chimes, jingle bells of various sizes, and a stethoscope. The sound station is usually of high interest but monitor the noise volume so it isn’t disturbing other children in the classroom. Guided Activity – “Matching Sound Eggs Game”: Make two each of the sound eggs (plastic Easter eggs) before the children arrive. Children shake them and try to find the two that match. Contents include: dry beans, coins, corn kernels, salt, cotton balls, and paper clips. Another option would be to use one container that was see-through and one that was not. Then the kids would have to match the sound but wouldn’t have to open the containers. One year, we took our ‘sound eggs’ outside to play a version of Hide and Seek and “Matching Sound Eggs Game” together. Children come up with the best games don’t they! Music: Listen to a variety of world music and try to identify some of the instruments. Compare the sounds to the instruments you have in class. Sing a song or chant a poem using an echo. One of my favorite echo songs to sing is “Down By the Bay”. Fine Motor Skills: Instruments provide many new fine motor skills for children to explore. If possible, bring in a variety of instruments for children to strum, pluck and drum on. Practice using a mallet on tambourines, chimes, or xylophones. Boisterous jam sessions with a wide variety of percussion instruments build fine motor skills and teach about sound. Ask the children, “Can we make soft sounds, loud sounds, gentle sounds, wild sounds, etc! A keyboard with headphones is one great way for children to play without disturbing the rest of the group. Writing Center: my preschoolers love using paper crimpers to make textured papers. I have a set of three crimpers and we discovered that each one makes a different sound! Another way to bring sound to the writing center would be to tie bells onto markers and pencils and children will create sound as they write! Art Project: Rain Sticks using paper towel tubes that have tape on one end, let the children fill their tube with dried beans using a wide mouth funnel. Then the adult helps close the other end with tape. Paint, collage, or draw onto the paper tubes. Later add mod podge to make them more durable. If you are making these with just one or two children, you might consider poking toothpicks or pieces of popsicle sticks into the sides of the tube so that the ‘rainfall’ is even more pronounced! Just be sure to cover with felt or card stock so the sticks don’t pop back out. Play Dough Center: Muffling Sounds with Play Dough – show children how to add beans or pebbles to plastic eggs. Compare the sounds of the eggs when one is covered in play dough and one is left plain. Why are there different sounds? Sound exploration with play dough – what else could we add to this activity to explore different sounds? Small jingle bells, metal washers, dried seed pods, etc. Water Table: add objects that make noise. Take a variety of clear plastic containers and fill them with various objects (dice, sand, rice, mini jingle bells, beans, and cotton balls). Seal them with electrical tape and ask the kids to keep them sealed. Kids can scoop them out of the water and shake them. Making matching pairs would be another fun idea! Sensory Table– dried beans as base, small container (plastic & tin) for the kids to scoop and fill, and then close to make shakers. 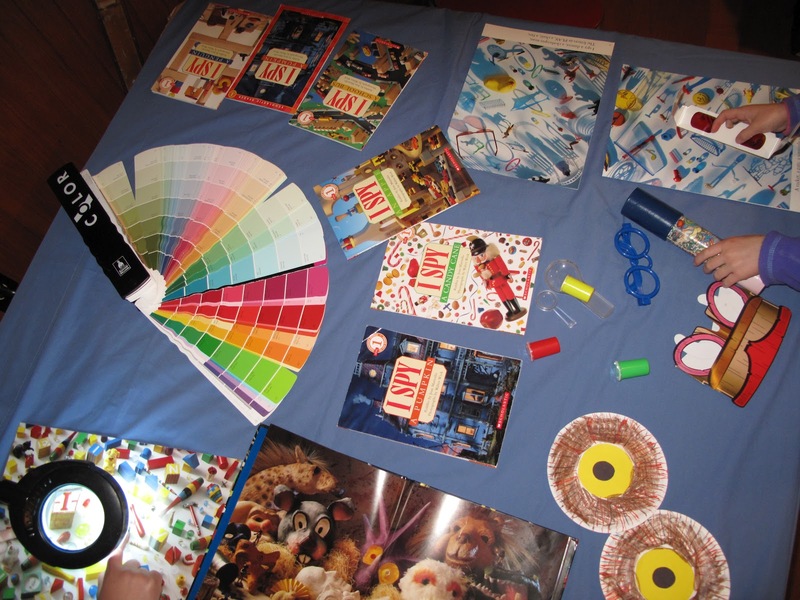 One another day try adding a variety of crunchy & noisy objects – cellophane, wax paper, bubble wrap, painted paper. Blocks & Building – add a few hand bells to see if children incorporate them into their building. Math Activities –there are many ways that we can integrate exploring sound and learning math! Count My Claps– explain to children that you want them to use their ears to count, so they need to close their eyes. Then clap a couple of times and ask children to show with their fingers how many claps you made. Practice with small numbers and then work towards larger numbers. Use instruments such as a drum or xylophone to count the beats! One Duck Stuck – read the story “One Duck Stuck” by Phyllis Root and explain to children that they will help with the refrain, “Help, Help, Who Can Help?” and the other refrain “I can, I can”. Then practice verbally counting to 10 as the number of animals increase on the pages. After reading, use plastic animal counter to reenact the story. This book naturally lends itself to active participation with its excellent rhythm and is a great book to work on counting skills! Guess My Sound – With their eyes closed, the adult makes a sound and the child guesses what made the noise. Try: clap, stomp, pretend sneeze, snap, whistle, cough. Instead of guessing the sound the kids could mimic the sound. Family Connections: Encourage families to play a CD or recording of common sounds and then have the children guess the sounds. Create their own recording using a tablet or phone while outside and then have another family guess what the sounds are! Thematic Healthy Snacks: Bring in an air popper and make fresh popcorn with the students. What sounds do we hear as the snack is popping?! Circle Time Learning – Show a picture of the inside of the ear & explain briefly how our ears work. One important thing about our sense of hearing is learning how to change the volume of our voice, especially when we are indoors. Can you show me your indoor voice, how about your whisper voice, and your outdoor voice? Read aloud, Listening Time by Elizabeth Verdick (explains how to be a good listener at rug time) and reinforce how our sense of hearing is important in being a good listener, especially at circle time! Oh the many ways we can explore our sense of TASTE! Outdoor – Since I love integrating nature into my teaching with young children, I always include an outdoor learning activity into my curriculum. For our sense of taste, I asked my children, “What are some things that we find outdoors that have flavors?” And even in the middle of winter in Vermont, my two children and I went on a walk in the yard and woods around our home and found several things that we could taste. Research – We began our discussion about our sense of taste. What part of our body helps us taste? We looked in a resource book to see that our tongue we have taste buds and found that different foods have different flavors – salty, sweet, sour, & bitter. My children were interested to learn that our tongue has different areas that taste these different flavors. 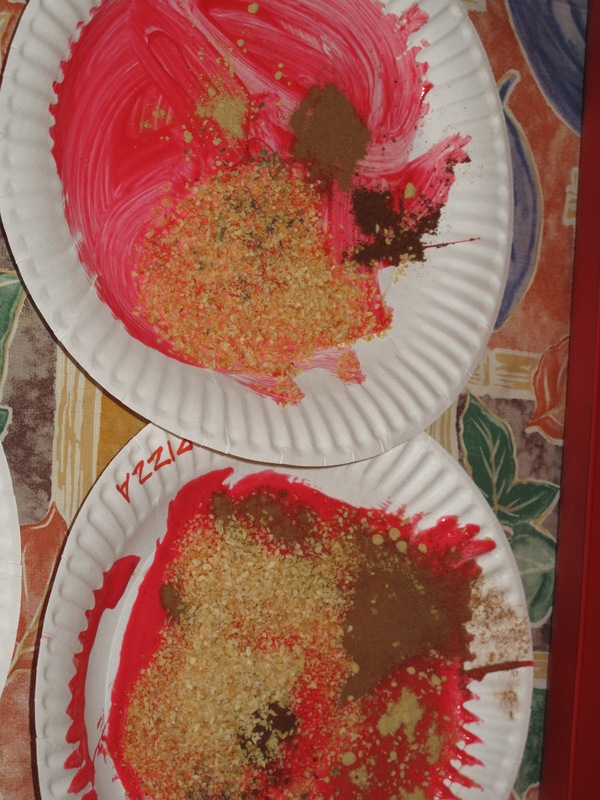 Art – Pizza Pies – children paint a paper plate with red colored glue and then sprinkle on a variety of herbs and spices. This was the first time we made these and the garlic salt made the whole room smell like a pizza shop! YUM! 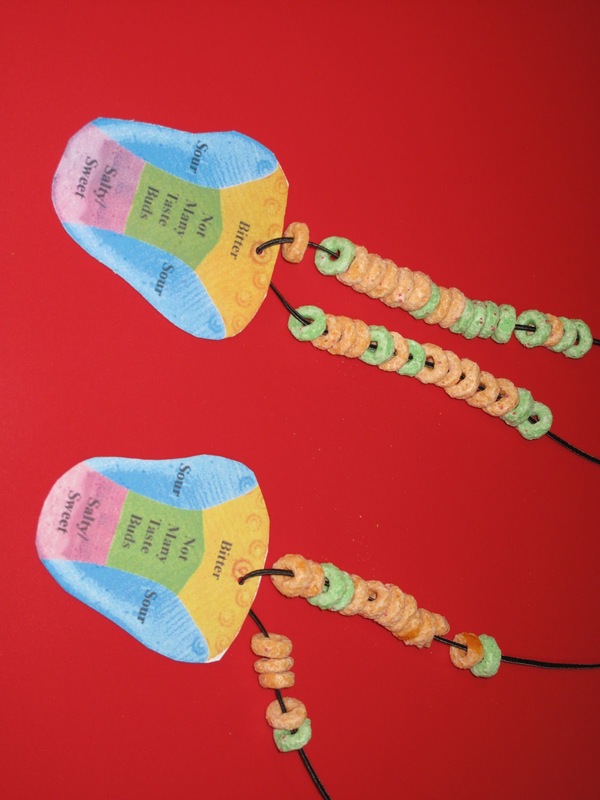 Math Activity: Apple Jacks Pattern Necklaces – Tape one end of a piece of yarn to the table and wrap the other end so it’s easier to thread. Provide each child with a measured amount of cereal, which they can finish their necklace with or TASTE. I added a photocopy of a tongue about mid-way of their threading. The kids thought the tongues were really silly – next year I would like to draw on a picture to go with the flavor word! Science Center: Tongue Mapping – I read about a family doing a tongue mapping activity and thought I would give it a go at preschool. Not all the kids got the idea that they were to touch a specific part of their tongue but they all enjoyed trying out a variety to flavors. Each child got their own tray: salty= salt, sweet = sugar, sour = lemon, bitter = unsweetened cocoa. I planned on giving a fresh q-tip for each flavor but the kids just started dipping away! If I do this again, I would do it in small groups instead of all together! See the link at the end of this post for the printable to use with this activity. Dramatic Play – kitchen set up with a large variety of foods! Water Table – plastic foods to wash in water table along with a variety of spoons, cups, strainers, scoops, etc. Sensory Table– beans, various cups, funnels, spoons, etc. Writing Center – provide grocery store circulars and food magazines for kids to cut. Encourage them to glue pictures of foods that they like the taste of to a paper plate. Closing Circle– “What is something you learned about TASTE today?” Pass around the Surprise Box with a fresh orange inside! Taste bud Taste Test: salty – pretzels, sweet – honey, sour- lemon, bitter- unsweetened cocoa. Talk about which of the foods they like the best. Tasting Party – have each child bring in a food to share. Serve small portions of each food. (The teacher could assign foods instead so a wider variety of foods would be sampled.) Suggest that families bring a food that is sweet, salty or sour such as fruits, vegetables, pickles, crackers, flavored cereal, etc. Children could sort them by taste or by texture (soft, chewy, crispy). Graph foods that the children liked the most. 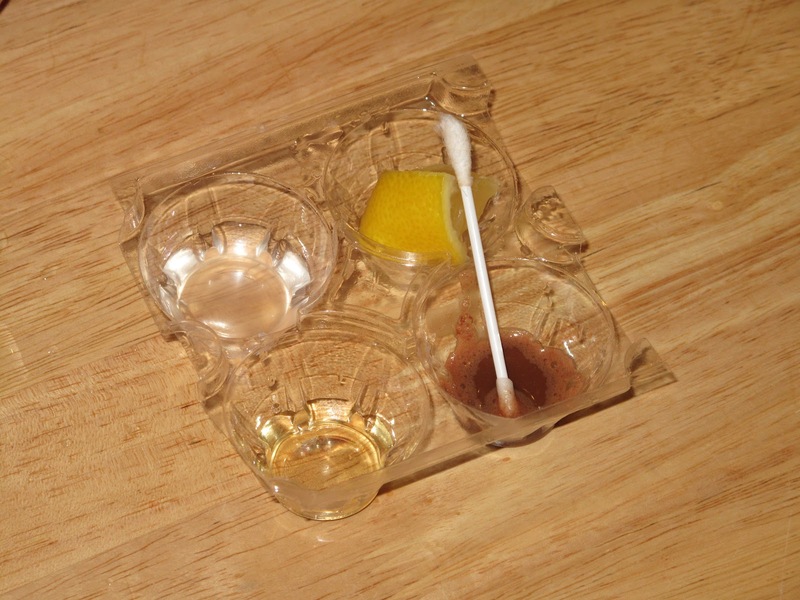 3 different clear liquids – sweet sugar water, salty salt water, and sour lemon juice! Popcorn Varieties: Make three types of popcorn – one with brown sugar, one with salt, and one with lemon. The children taste each of the popcorn flavors and decide which their favorite is. Make a chart to show which is the favorite flavor. Check out my pinterest board for more 5 senses activities! There are so many wonderful ways to explore our sense of sight…. Outdoor Activity – make pretend Binoculars by using hot glue to attach two toilet paper tubes together and add a string. Though these binoculars do not make objects appear closer, they do help children focus in on objects. Can you spy a squirrel nest? Can you find a pine cone still hanging in the tree? 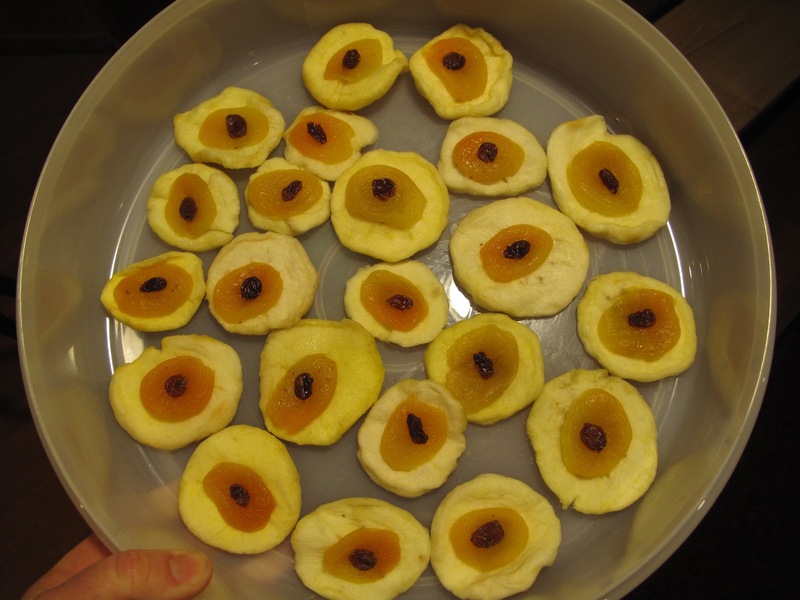 Eye Themed Snack – a fun little snack one of the my preschool parents came up with years ago– dehydrated apple ring with an apricot and raisin! Guided Activity – “Secret Message Hearts” – ahead of time I cut out heart shapes and with a white crayon wrote each child’s name onto them. Then they used water colors to reveal the hidden message. I had extra heart cut-outs and crayons available for them to design their own too! 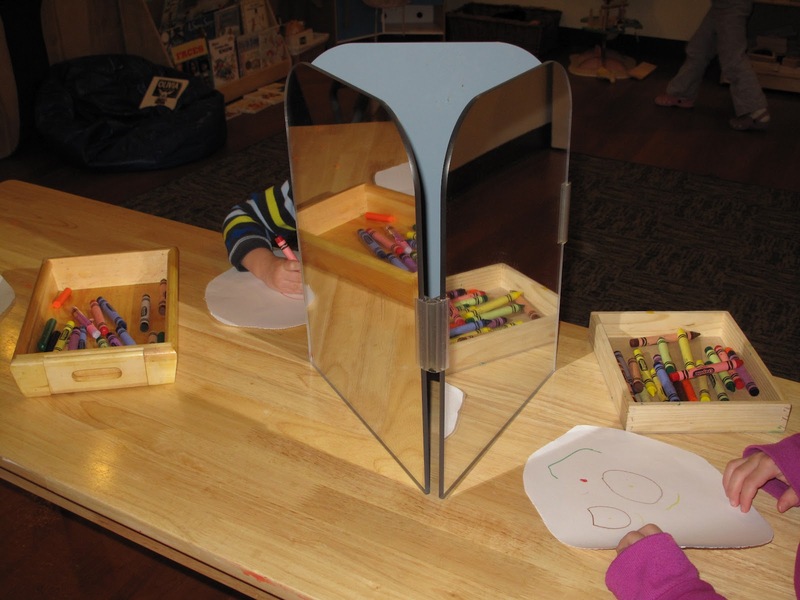 Art – Self Portraits using a 3 sided mirror. Children would look at themselves and then draw the details of their faces. Science Center: “Sight Station”- illuminated magnifying glass and I-Spy pictures; microscope with simple slides, Paint chip book to view various shades of color, unbreakable mirror, hand-held magnifying glasses. I was planning on having the children make their own “red vision tubes” but somehow have run out of toilet paper and paper towel tubes. How can that be?!? I made just one to share by covering a paper towel tube with red cellophane over one end. Water Table – rainbow colors using several plastic containers filled with water & liquid water colors. What do we SEE when the colors mix together? Sensory Table– an “I Spy” sensory bin for the kids to play with each other. “I see something yellow and small.” I also added the bingo cards from an “I Spy ABC Bingo Game” and foam alphabet letters from a puzzle. I thought kids might like to LOOK for matching pairs or to sort by color! Closing Circle– pass around the red vision tube. What part of our body helps us to see? When we look through the tube why do we see red? Why do people wear glasses? Read aloud: Brown Bear, Brown Bear, What do you See? Check out my pinterest board for even more ideas about teaching about the 5 senses!